An NBC Bay Area Investigation reveals thousands of consumer complaints against auto repair shops are kept secret each year by a California agency created to protect consumers. Albert and Michelle Delao noticed some bizarre changes to their 2002 GMC Yukon after the couple hired an auto shop in San Jose to make a few repairs to the SUV. "When you turn the wheel [there were] cracking noises." Michelle Delao said. "Squeaking noises." The family would later discover that employees at their auto repair shop went to considerable lengths to hide serious damage that was done to the vehicle – more than $11,000 worth, according to repair estimates collected by the Delao family. "I couldn't believe it," Michelle Delao said. "I just couldn't believe that they could do something like this and cover it up." For the 25 million licensed motorists in California, finding an honest mechanic is essential. Fraudulent repairs can create both financial hardships and serious safety hazards. As the NBC Bay Area Investigative Unit uncovered, howevever, the state agency responsible for protecting consumers, may be hiding critical information that protects disreputable shops from public scrutiny. The California Bureau of Automotive Repairs (BAR) was created to keep repair shops in line with state regulations. But Albert and Michelle Delao believe that lax oversight by the agency put them and other drivers at risk. They are among the majority of customers who receive little justice, from this state agency. The NBC Bay Area Investigative Unit reviewed state data for the past three years and discovered that fewer than 3 percent of the complaints pertaining to auto repairs result in any kind of enforcement action. That’s because under state law the bureau has limited authority to issue penalties for violations. "It just makes me feel that they're not doing their job," Albert Delao told NBC Bay Area. He and his wife said their problems began last November when they their family SUV needed repairs. The couple took the vehicle to a Midas shop on Monterey Highway in San Jose. After a short drive, Michelle immediately noticed something amiss. "We called [Midas] and they said nothing happened," Michelle said. "I knew something happened, but they just weren't saying what happened," Michelle recounted. Albert dismissed his wife’s conspiracy theory and bought four new tires from a nearby wheel shop. However, the nearly $300 purchase didn’t seem to have any effect on the strange noises coming from their vehicle. That very same day, the Delaos received a strange call from a former employee at the Midas shop. "He said, ‘well, the rattling you hear, it is glass,’" Albert told NBC Bay Area. 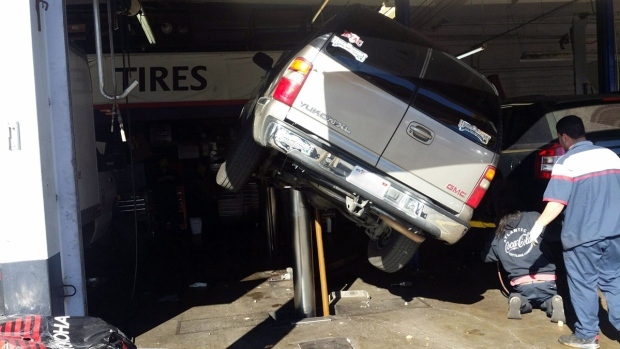 The mechanic, turned whistleblower, revealed that the eight-passenger SUV fell from a mechanical lift, crashing onto its side from several feet in the air. 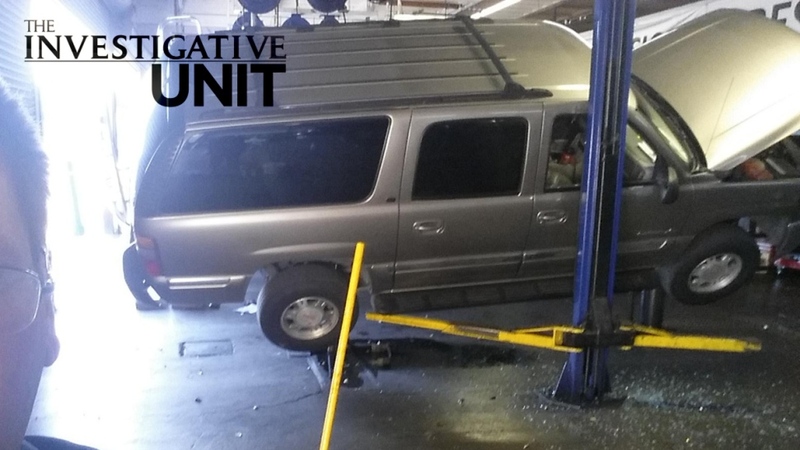 The lift pierced the bottom of the vehicle and shattered the front passenger window. Former employee Adam Wicklander provided the family with photos to corroborate his story. Wicklander claimed that after the crash, he and his coworkers were ordered by their district manager to fix the car as best they could, without telling the Delaos. Their makeshift repairs left dents, scratches, and uneven paint across the vehicle. In addition, shards of glass from the broken window remained scattered inside the passenger door. A pair of other repair shops assessed the damage – the estimates totaled $11,568.28. The Midas shop’s District Manager Jawad Khan confirmed "the lift malfunctioned" and in a memo to the Delao family admitted, there was a "cover-up," but he denied any involvement and blamed it all on his employees. Angered by the deception, the Delaos filed a complaint with the Bureau of Automotive Repair. But the couple says a bureau investigator told them there was little the agency could do. The mechanic, turned whistleblower, revealed that the Delaos’ eight passenger SUV fell from a mechanical lift, crashing onto its side from several feet in the air. "These people are put there so they can be the authority, so they can put a stop to this," Albert said. "But if people are just getting put on the back burner, it's always going to happen." Bureau Chief Patrick Dorais explained to NBC Bay Area that current law only allows his agency to issue fines and citations to unlicensed repair shops, or to those that violate the state's smog check program. For all other violations, like deceptive repairs and fraudulent billing, investigators can only recommend cases go to court. However, those recommendations rarely occur since cases often require a chain of similar consumer complaints before investigators can proceed. NBC Bay Area asked Dorais what happens to drivers who might be the first to complain about questionable business practices. "We’ll try to mediate the complaint with the shop, sometimes there is rework or adjustments to the bill, or a direct refund that’s given to that consumer," Dorais said. While BAR can’t penalize auto shops for most violations, the bureau’s mediation process nets consumers nearly $5 million each year in voluntary repairs and refunds. However, since citations are not issued for violations, those consumer complaints are kept secret from the public – even in cases where the state believes a repair shop took advantage of customers. "The potential harm is that you’re going to end up at a shop that rips you off or puts you in an unsafe car," said Rosemary Shahan, an auto industry watchdog who has sparked nationwide changes in auto safety. Shahan heads Consumers for Auto Reliability and Safety, and believes California should be more forthcoming with drivers about which repair shops have a history of alleged violations. In recent years, the bureau has removed information about consumer complaints from its website. The Investigative Unit filed a request under the California Public Records Act to see those complaints, however, the request was denied. "If we posted information where we felt [a repair shop] violated the law, and they didn’t get a chance to defend themselves, we would be in trouble as a government agency for doing just that," Dorais said. After NBC Bay Area contacted BAR about the Delao family’s SUV, the case was reassigned to a new investigator. The bureau issued an inspection report to the Midas shop, citing several potential violations including performing work without authorization, and failure to properly invoice repairs. Still, no actual citations or fines were issued, and the Midas shop’s discipline record remains unblemished. NBC Bay Area also reached out to Midas corporate headquarters for this report, however, the company only provided a brief statement. "Midas locations are independently owned and operated," the statement read. "Since inception, 60 years ago, Midas has taken great pride in building trusted customer relationships based on reliability and professional service." The Bureau of Automotive Repair can refer cases for prosecution to the California attorney general or local district attorneys throughout the state, however, it is unclear if investigators will take such action in the situation involving the Delao family. In the meantime, Albert and Michelle are considering suing the Midas repair shop for damages.